He was the archetypal genius. A painter. A scientist. An inventor. An engineer. Even today, he remains the dictionary definition of a Renaissance man: Leonardo da?Vinci. In Leonardo’s Brain, surgeon and best-selling author Leonard Shlain undertakes a hypothetical dissection of the ancient master’s intellect, attributing the roots of his creativity to a particular arrangement of his gray and white matter. Da?Vinci’s brain must have functioned unlike any that came before or after, the author postulates, thanks in part to enhanced white-matter connections between his right and left hemispheres. Shlain applies modern neuroscience to probe one of history’s most innovative brains and uses da?Vinci as a lens through which to view the broader issues of brain organization, creativity, and consciousness. Ironically, Shlain’s own brain was being ravaged by cancer as he finished what would be his final work. Dying just eight days after completing the book in May 2009, Shlain instructed his children to see to its publication. The work stands as the last in a line of probing and entertaining books from a thinker who possessed his own brand of genius. Humanity is poised to crack open the mysteries of the human brain. And we’re going to need a roadmap. Gary Marcus, a professor of psychology at New York University, and Jeremy Freeman, a computational neuroscientist at the Howard Hughes Medical Institute’s Janelia Farm Research Campus, provide just this by curating a compilation of essays from today’s leading neuroscientists. Works from visionaries such as Harvard’s George Church, Misha Ahrens of the Howard Hughes Medical Institute, and the newly minted Nobel laureates Edvard and May-Britt Moser explain, in plain English, the science and technology leading neuroscience into a new era. 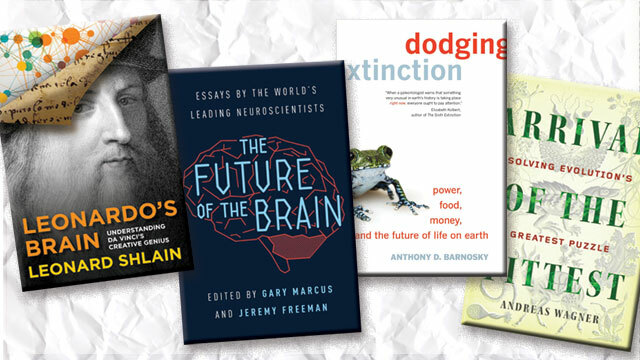 Dispatches from the scientific minds at the forefront of the quest to map and understand the myriad neural connections that constitute evolution’s most curious creation, the essays that make up The Future of the Brain serve as great primers in topics scientific and logistical: from memory and consciousness to the computer modeling of neural complexities to big-data analysis. On the eve of Earth’s sixth mass extinction event—this one made unique by the fact that it is the inadvertent result of humanity’s actions—it is time to act in a newly conscious and urgent way. This is the clarion call sounded by University of California, Berkeley, paleobiologist Anthony Barnosky in Dodging Extinction, his latest book on the realities that face a warming planet and its hapless inhabitants. Humans will have to radically change the ways we generate power, grow food, and make money, in order to keep Homo sapiens itself off the lengthening extinction list. Barnosky lays out convincing evidence of the trouble we’re in, and a comprehensive plan that just might help us avert the worst of it. Reading about the mass extinction of thousands of species got you down? How about focusing on the other end of the spectrum? Evolutionary biologist Andreas Wagner’s latest book, Arrival of the Fittest, tackles the mystery that eluded even Charles Darwin: how nature generates the raw material—in the form of genotypic and phenotypic variation—for the generation of new species. In Arrival, Wagner reviews the intellectual and scientific evolution that has led to the development of the systems biology concept of genotype networks—a biomathematical construct that describes the ability of sets of genotypes to generate similar or different phenotypes. “Genotype networks are the common origin of the different kinds of innovations—in metabolism, regulation, and macromolecules—that created life as we know it,” he writes in the book’s epilogue. Wagner breathes mathematical life into the genetic library of all living things and carefully makes the case that their ability to self-organize is not only evident but available to human understanding and prediction.